I have an interesting proposal for you. Would you trade a little bit of your home WiFi bandwidth for the ability to use a stranger’s WiFi network for free when you’re on the road? That’s the idea behind FON’s Fonera, a new 802.11n wireless router with a community-based twist. See, each Fonera router owner shares a little piece of their home WiFi bandwidth with other Fonera owners. That way, if you’re far from home, you can still enjoy free WiFi any time you’re within reach of the 12 million Fonera routers currently in use worldwide. There’s even an iOS and Android app to help you locate nearby Fon hotspots. The Fonera router lets you connect either by traditional password or through using your Facebook account credentials. Whenever a Facebook friend visits your house, they can use your router without a password. All outside connections use a separate, second router signal, keeping your home network safe. FON is only just now launching in the United States, but there’s a lot of promise behind the idea – Comcast launched a similar shared WiFi idea earlier in the year. FON’s reach is decidedly smaller, but the company is actively working on deals with ISPs to bring more users into the fold. 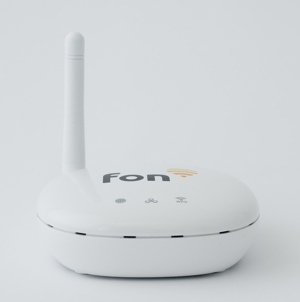 The FON Fonera router will be available for purchase from Amazon and through the company’s website for $59.